On a cookie sheet, evenly spread hazelnuts and put them in the oven to roast at 400F for about 8 min. Check them often it roast fast! Let them cool and take out the shells by scrubbing them together. Place them in a robot and crush them for 5 min, until it start to look like butter. Add the rest of the ingredient and mix them for as long as it takes for you to like the texture. Some like it more crunchy, some like it more smooth. Slice a piece of bread and spread your newly made butter on it. There are variation of this recipe that contains milk or dried powder milk products to make it more like the store-bought thing but I tend to make the recipe more simple. We tend to use organic ingredients. * I had a friend make it by replacing the hazelnut by almond for her allergic daughter and they found it very good as well. I guess any kind of nuts would work. I suggest keeping it in your fridge since they’re no preservative. I usually double the recipe and it last us about a week. 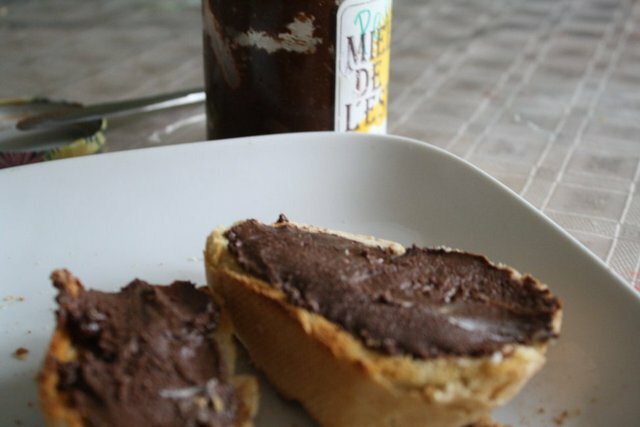 It is SO good on toast, untoasted bread, fruits. It relatively takes no time to make and is so easy to offer in a pretty jar. 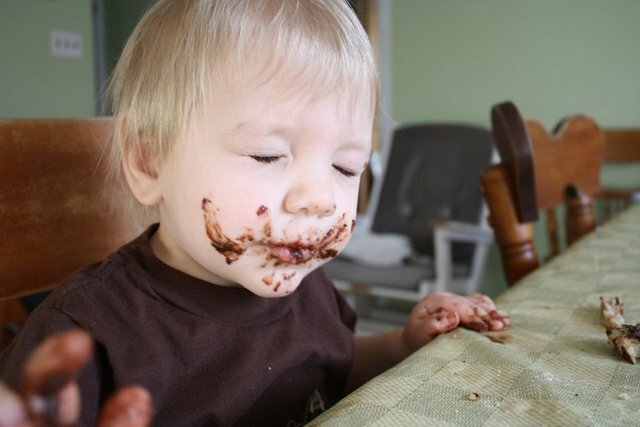 The kids can help measuring and dumping the ingredients in the robot and will lick the spoon afterwards. Is organic clothing really healthier for children? September is the month to celebrate all things green and organic. But does organic really matter? Is organic clothing really healthier for children? – These are the most common questions I’m asked by people who hear about my business. Let me give you just the facts, and you will be able to answer these questions yourself. Did you know that our skin is the largest organ in our bodies? And what we put on this skin is just as important as what we eat. The skin easily absorbs the everyday chemicals it comes into contact with, allowing them to go into bloodstream. A baby’s skin is very sensitive and is thinner and more porous than an adult’s. It’s less resistant to the harmful substances and bacteria in the environment. This means that babies are at a greater risk for health problems related to the absorption of pesticides. When these harmful substances are found in clothing or bedding which come into contact with a baby’s skin for extended periods of time, the possibility that these toxins make their way into your baby’s body greatly increases. Conventional cotton is probably the most widespread carrier of toxins and is thus, the most dangerous. Each year cotton producers all over the world use more than $2.6 billion in pesticides, which is more than 10% of all agricultural chemicals. 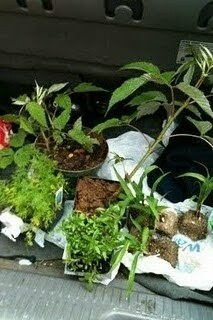 Since it is not a food crop, pesticides, herbicides, and chemicals used on it are not regulated. According to the EPA, seven of the top 15 pesticides used on U.S. cotton crops are potential or known human carcinogens. It takes over a third of a pound of pesticides to produce one cotton T-shirt! Not only do these highly toxic chemicals contaminate the soil, but they also pollute the air and the water, as well as destroy the farmers’ health. According to the World Health Organization, about 20,000 deaths occur each year from poisoning by agricultural pesticides. It doesn’t stop here. During processing, fabrics undergo chlorine bleaching and are dyed with products containing heavy metals. 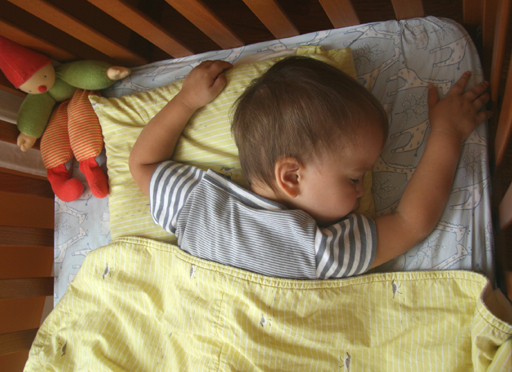 Children’s bedding and clothes are usually treated with flame retardants which most likely contain polybrominated diphenyl ethers (PBDE’s) known to be endocrine disruptor. No amount of washing gets all of the chemicals out! It is true that organic baby bedding and clothes are more expensive. But more and more companies are beginning to offer organic fabrics and children’s clothes, making them more affordable. Additionally, products made from organic cotton last about five times longer than those made from conventional cotton. This probably has to due with the great number of processes that conventional cotton has to go through, which result in the breakdown of the fibers even before the fabric is sewn! So, in the long run, buying organic seems to be a more financially-profitable option, and organic clothing and bedding bring so many healthy benefits that they’re worth the money! Today’s recipe is by Cyn of FairiesNest (be sure to check out her lovely shop here). 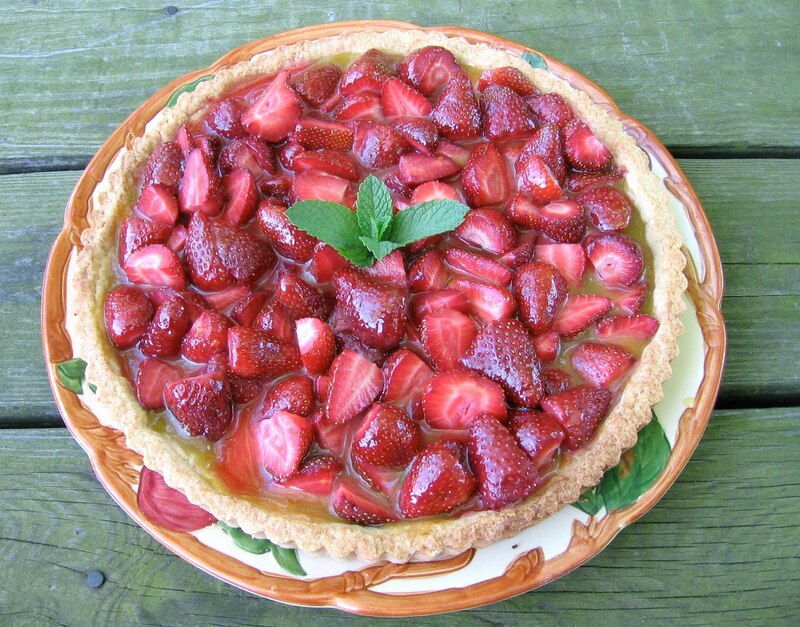 The timing for this recipe is perfect with so much local fruit just coming into season (can’t wait for our local organic strawberries in June). It would make a delightful Mother’s Day surprise too. 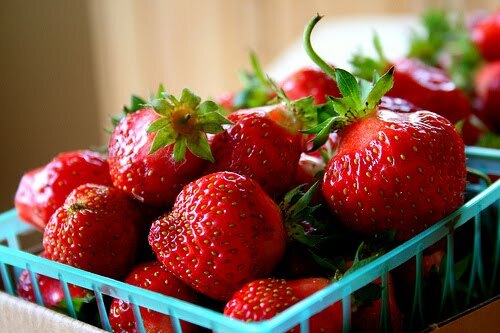 The strawberries in our part of the world are coming in fast and furious. To make this fruit tart, you start with a pre baked tart shell, preferably a sweet shortcrust. My favorite one is from the book Festive Tarts by Sylvia Thompson. (This is a fantastic tart book that I highly recommend and although it’s out of print you can find cheap used copies). Combine the dry, cut in the butter until the mixture resembles cornmeal, add the wet and mix lightly until a ball of dough forms. refrigerate for 15-30 mins. Roll out and place in tart form. Stick in the freezer for 30 mins and then bake in a 400 degree F oven with pie weights (or dried beans) on a piece of parchment inside. After 15 mins remove the weights and bake for 12 more mins. Cool and fill! Cut up enough fruit to fill your tart; peaches, berries, plums, all of one kind or a mix …whatever you think is yummy. Mix together 1 cup sugar with 3 cups of orange juise and 4 tablespoon cornstarch in a saucepan. Heat this stirring constantly until it thickens. Put about 1/3 of the mixture in the bottom of the tart. Now place in the fruit in a pretty pattern or all mixed up, it doesn’t matter. Then carefully cover all the fruit with the rest of the OJ sauce. Refrigerate for at least an hour, but not more than 4 or 5 because you don’t want it to get soggy…though it will still taste good! One little trick; if you’re using fruit that might brown, like peaches, toss them with the OJ first and then drain them and proceed. It also gives the OJ a great peachy taste… This works well for freezing peaches too! 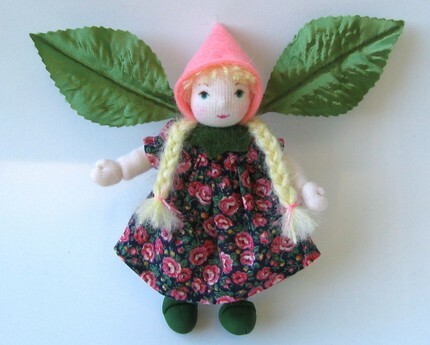 Here‘s a sweet spring flower pixie from Cyn’s shop!